The following review is based on a copy I got from the publisher via NetGalley in exchange for my honest opinion. From the moment I finished Pushing the Limits (read my review here), I knew that I wanted to read anything else Katie McGarry writes. 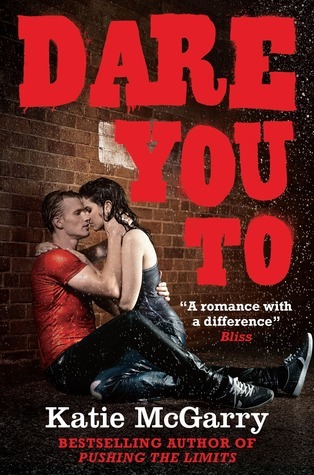 I itched to get my hands on Dare You To as soon as I read the sneak peek in the back of my ARC. And I wasn’t disappointed! Once more Katie McGarry delivers an achingly realistic tale with complex characters. I was a little thrown going into the story because I expected it to be that of Beth and Isaiah, and I was a tad reluctant to really take to Ryan. He’s not the type of guy I usually like, but he also ended up being a very different person from what I’d first expected. Trust me: once you see things from Beth’s point of view, you’ll realize why she and Isaiah wouldn’t work. Beth doesn’t have many prospects in life, to a large part because she keeps being dragged down by her alcoholic mother. She’s the one to juggle the bills, to try to keep them somehow afloat, and to drag her mom home from the bar. But after a confrontation with her mother’s violent boyfriend ends at the police station, she is picked up by the man she least expected – her father’s brother, Scott, who is now her legal guardian and loses no time in taking her away from her ‘home’ and friends in the city out to his small town. Her relationship with Scott is weighed down by past issues and by his quasi-hero status in town for his success in baseball. Baseball is what connects Scott to Ryan, whose father pushes him towards a professional career in the sport instead of going to college. When I first ‘met’ Ryan, I thought he was your usual cocky jock, used to getting whatever he wants when he wants it. The dares he and his friends challenge each other with range from hilarious to retarded, and his motto of ‘I don’t lose’ annoyed me in the beginning. However, I learned to respect him and his passion for the sport. He was very different to what I expected and behaved in a respectful way towards other people – he’s a good guy with many more talents than just baseball, even though it takes him a while to admit that to himself and act on it. Much of his arc focuses on his relationship to his overbearing father (whom I wanted to throttle) and how much he is willing to sacrifice in order to please him. When Beth and Ryan meet, sparks fly. Sometimes they’re angry sparks, sometimes they’re steamy sparks, but the chemistry between them is undeniable. What starts as a dare eventually becomes more than either of them would have expected, and I loved seeing them struggle against their emotions, challenge each other, and eventually learn to trust one another despite the many obstacles people put in the way of their relationship. Especially Beth is constantly jerked from one side to the other as she realizes she has a chance at a new life, at hope for a future, but can’t let go of her past and doesn’t want to forsake her friends and her mother. Though from the outside, Beth and Ryan’s home lives look like opposites, both their families are rotten at the core. In my opinion, Dare You To was well-paced, with a good balance between more action-focused and dramatic scenes as well as calmer moments where McGarry’s skill at character development is given room to unfold itself. I alternately hurt, raged, and occasionally turned into a puddle of goo (I will never look at rain water in the same way). The story is never boring but I also never felt like I was being breathlessly hurried along. The characters’ conflicting emotions and Beth’s traumatic past need time to unravel and become real to the reader. Yet despite the many dark themes in the novel, there were also lighter, more humorous moments, usually in the dialogue between Beth and various other people. Dare You To is a story of hope, guilt, rising above oneself and one’s station, sticking up for what and who you love, and about how much you’re willing to give up for your family. The novel is highly emotional but McGarry’s no-nonsense prose leaves no space for cheap drama. For those of you who want more of Echo and Noah - they have short guest appearances but the focus is clearly on Beth, Ryan, and to an extent Isaiah (who will get his own novel). My one sort-of-complaint is that though the emotions were very well-crafted and believable, somehow the story didn’t impact me quite as much as Pushing the Limits did. It made me tear up, but I never cried. I was satisfied but missed that feeling of catharsis. That might just be me though, or the overall state of mind I was in. I definitely enjoyed how well-crafted the story was and how the various layers and issues played into one another! If you like contemporaries dealing with tough but realistic topics and romance between strong characters, you will enjoy this one! I’d recommend it to the more mature YA readers though because of language, drug abuse, and sexually charged situations. Excellent review Carmen! I just recently got a copy of Dare You To at BEA, but since I haven't read Pushing the Limits yet I didn't think I was going to keep it...reading this makes me think I should hang on to it and get my hands on the first book soon :) Thanks for sharing!! Keep it ;) Actually, I think you could even read it without having read Pushing the Limits - the main characters from there only show up occasionally and their arcs don't play such a big role in this book. Thanks so much for commenting! And I hope you had fun at BEA - wish I could've gone!!! Another great review, Carmen! I actually liked this one better than Pushing the Limits, but I think I'm in the minority with that sentiment. Either way, this is a great series with complex characters and situations, and your review highlights that perfectly. I absolutely loved this as well!! Beth's character really resonated with me. My only complaint was how it made me feel about Echo and Noah. But I understand why. An excellent companion. Yes, it was weird seeing Echo and Noah through Beth's eyes, wasn't it? But I also get why she felt that way. Thanks for commenting! I can't wait for Isaiah's story either! Thanks for commenting. This is a fantastic review! I'm a new follower, and I look forward to reading more from you! I loved both books, not sure which over the other. I think I rated them both the same. Anyway, I totally agree with you about Ryan - he definitely grows on ya, doesn't he?